Sorry, I didn’t receive the details about GSC’s Star Wars: The Force Awakens advance ticket sale until it had begun for days. But fret not, it’s still not too late. I still managed to get mine to catch it on the first week itself although the tickets were practically sold every minute or so. The film’s releasing on December 17th but if you’re at least as big of a Star Wars fan as I am, you’d wanna catch it the soonest possible so hurry and purchase your tickets at any GSC ticketing counter nationwide or via GSC e-Payment on GSC.com.my or via GSC Mobile App (iOS, Android & Windows Phone). At GSC, the film will be available in 2D, 3D, Maxx, D-BOX & Dolby Atmos and just Dolby Atmos alone as well at certain GSC outlets (check their website for more info). For advance ticket-buyers, GSC is also offering two exclusive limited edition Star Wars: The Force Awakens t-shirts (refer to visual at the top) that you can get when you purchase the titular e-Combo which consists of both of the t-shirts, two regular soft drinks and one large popcorn. While stocks last only so get ’em now via GSC e-Payment or GSC Mobile Apps. The titular concession promotion will be launched on December 10th where patrons can purchase the Star Wars combo at concession counters for RM30 at GSC West Malaysia, RM30.50 at GSC Signature @ The Gardens Mall and GSC East Malaysia, and RM29.80 for GSC Lite Cinemas. 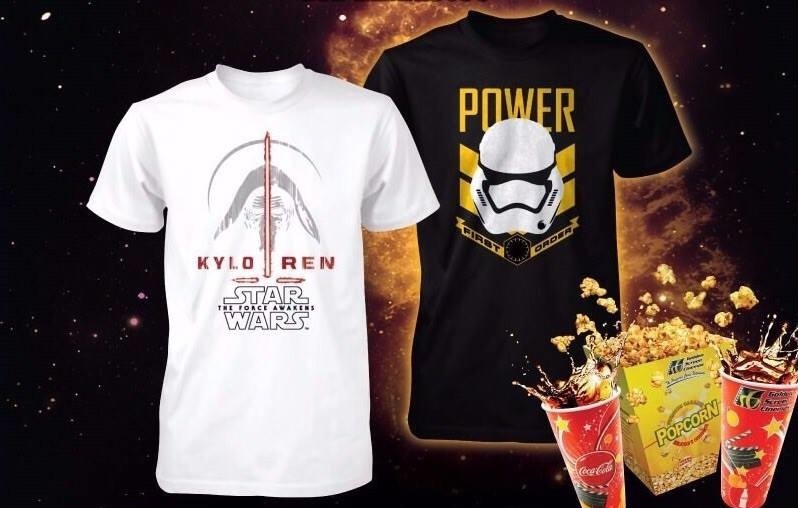 The combo includes a single SWTFA t-shirt (choose one of the designs), two regular soft drinks and one large popcorn. Trust me, they’ll sell out in a blink of an eye so be quick and manage your schedule! I'd be impressed if you did.